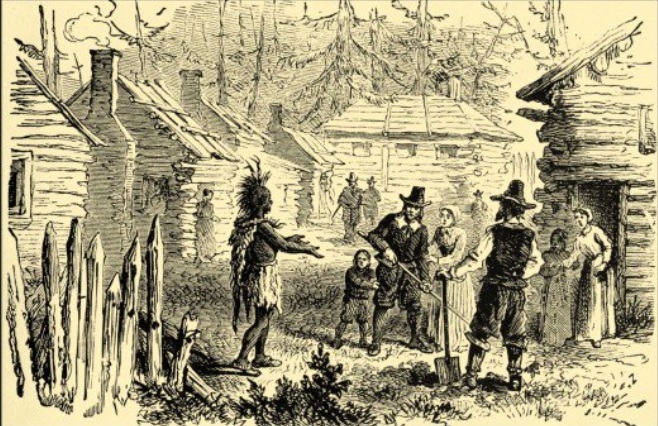 Settlers in New England highlighted the conflict between two powerful human motivations: greed and the gospel. Gospel-motivated missionaries wanted to bless the native inhabitants, both physically and spiritually. 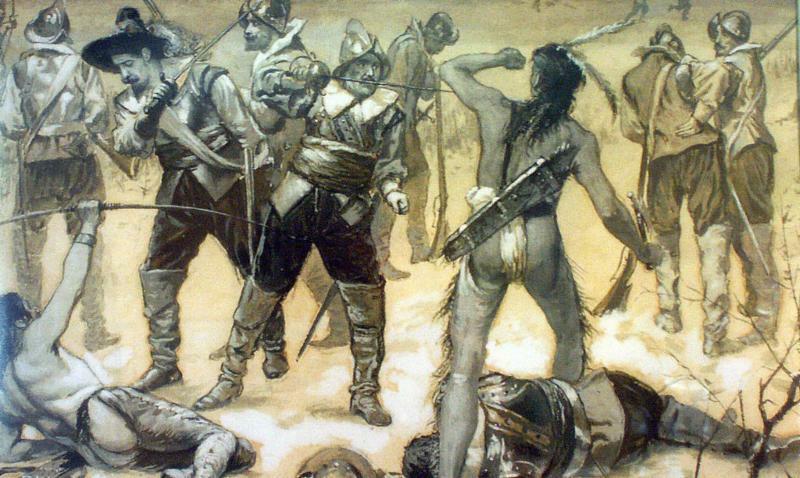 Unfortunately, greed-motivated settlers viewed natives as an unpredictable danger obstructing safe expansion, as they would sometimes steal from farms or kidnap women and children. 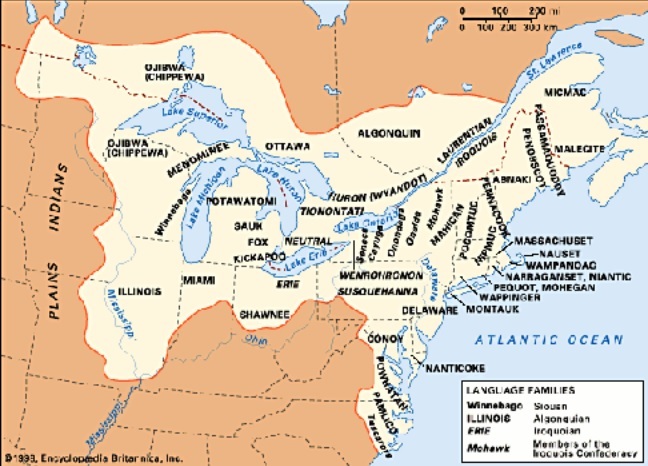 Compared to civilizations of Europe, Asia, India, North Africa, and the Middle East, natives of North America still subsisted rather primitively. The abundance of wild game and fish meant there was little need to domestic animals and crops, read or write, smelt bronze or iron, or even invent a wheel. Indians traded animal pelts for manufactured items, such as knives, axes, guns, and unfortunately, alcohol. ﻿The Indians' dilemma was that, on one hand, they wanted to trade with the colonists, but, on the other hand, they grew in their dependency. 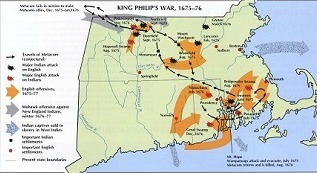 As Indians began to resent encroachment on their lands, a conflict erupted, the Pequot War of 1637. In contrast to greed-motivated settlers were the gospel-motivated settlers who wanted to benefit Indians. Thomas Tupper (1578-1676), a founder of Sandwich, Massachusetts, who as a charter member of the church there, being deeply interested in religious work among the Indians. 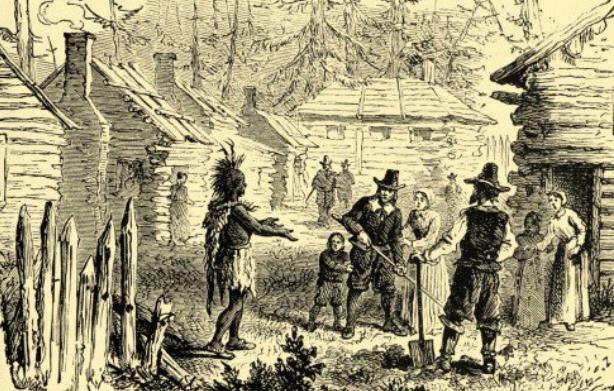 ﻿Richard Bourne (1610-1682), who sought fair treatment for the Indians and worked for 20 years to secure for them protected reservation land at Mashpee. 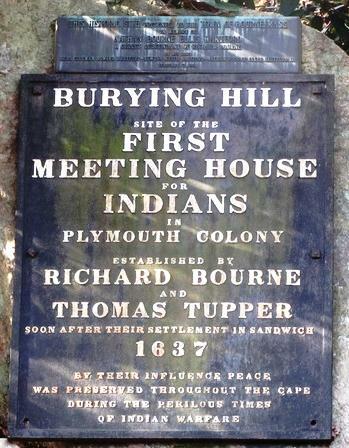 "Burying Hill, site of the First Meeting House for Indians in Plymouth Colony, established by Richard Bourne and Thomas Tupper, soon after their settlement in Sandwich, 1637. 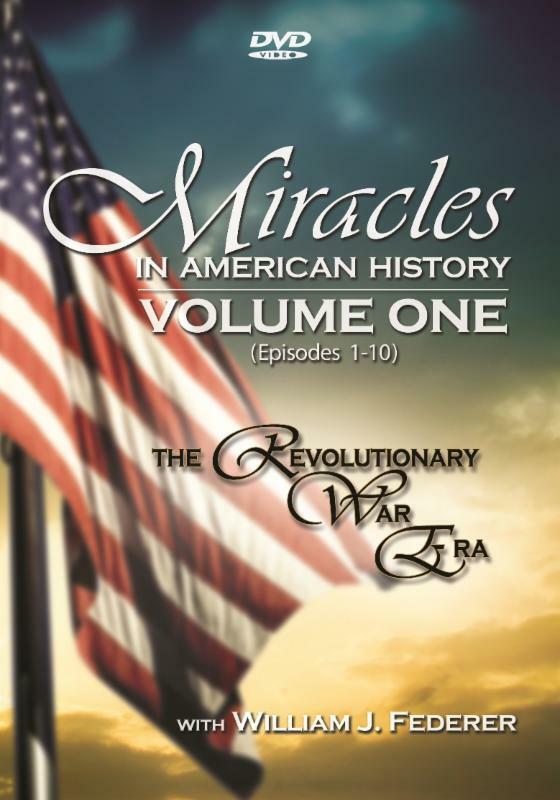 ... By their influence peace was preserved throughout the Cape during the perilous times of Indian warfare." 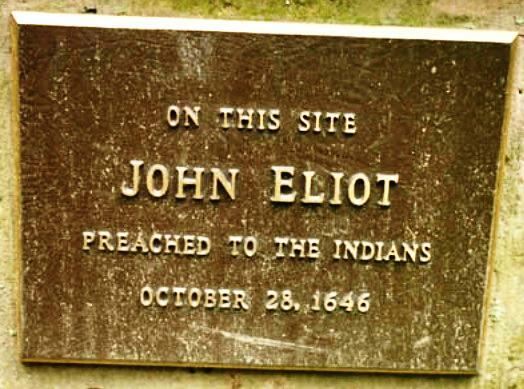 Another Gospel-motivated setter was Missionary John Eliot. He was called "Apostle to the Indians." John Eliot was baptized in England as an infant on AUGUST 5, 1604. 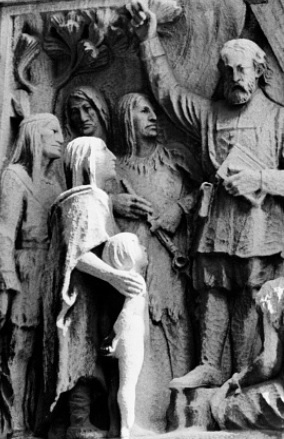 He sailed to America and preached his first sermon in the Algonquian language in 1646. Eliot printed the first book in North America - the Bay Psalm Book. 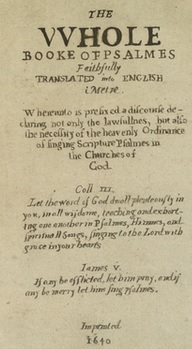 Eliot translated the Lord's Prayer, the Ten Commandments, and the Bible - the first to be printed in America, in 1663. 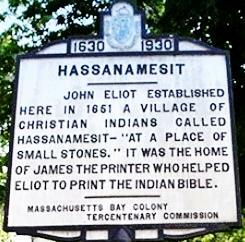 "John Eliot established here in 1651 a village of Christian Indians called Hassanamesit - 'at a place of small stones.' It was the home of James the Printer who helped Eliot to print the Indian Bible." "The Word of God is the perfect System of Laws to guide all moral actions of man." In a 1674 census, there were 4,000 "Praying Indians" in 14 self-ruling villages. Villages were complete with houses, streets, bridges, and their own ministers. 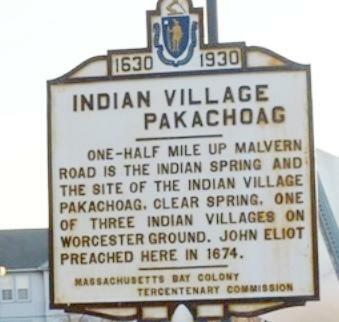 One-half mile up Malvern Road is the Indian Spring and the site of the Indian Village Pakachoag- Clear Spring. One of three Indian villages on Worchester ground. John Eliot preached here in 1674." 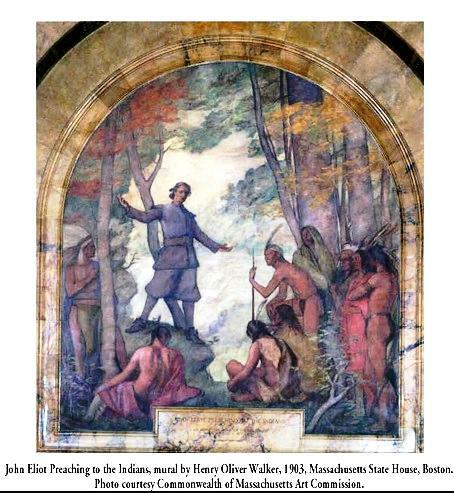 "Praying Indian" villages were located throughout Massachusetts, Martha's Vineyard and Rhode Island. 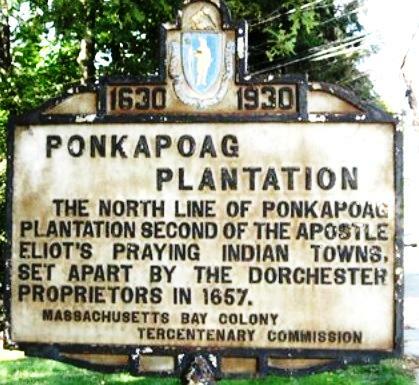 "Ponkapoag Plantation, The north line of Ponkapoag Plantation, second of the Apostle Eliot's Praying Indian towns set apart by the Dorchester Proprietors in 1657." 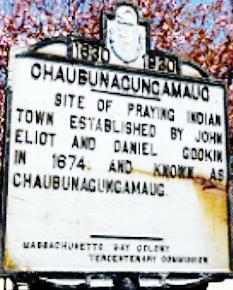 "Chaubunagungamaug, site of Praying Indian town established by John Eliot and Daniel Gookin in 1674 and known as Chaubunagungamaug." ... 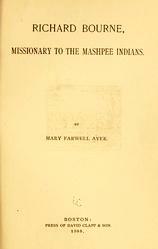 The Teacher of the Praying Indians of Nantucket, with a Brother ... who made good Confessions of Jesus Christ ... did make report that there be about ninety families who pray unto God in that island, so effectual is the Light of the Gospel." 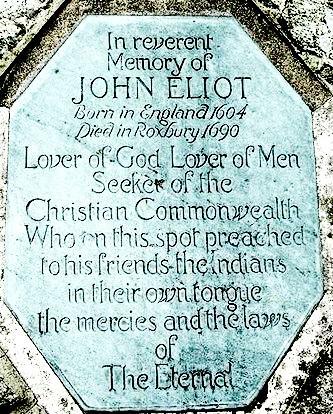 On this site, John Eliot helped his Indian converts to build their first meeting house in 1651, with a 'Prophet's Chamber' where he lodged on his fortnightly visits to preach to them in their own language. His disciple Daniel Takawambait succeeded to the Pastoral office in 1698." 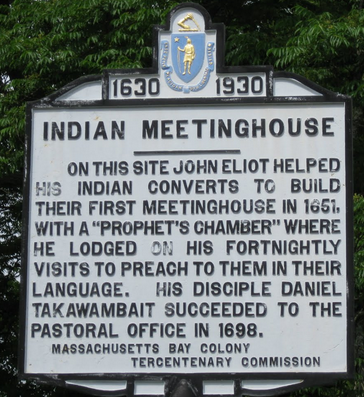 Daniel Takawambpait was New England's first Indian minister, ordained in Natick, Massachusetts, in 1681. 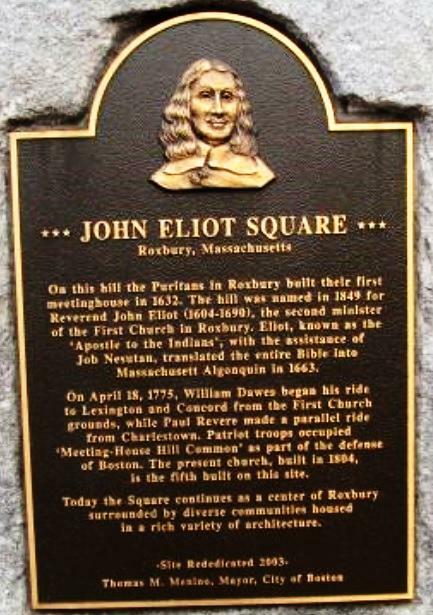 Boston 's John Eliot Square is by the intersection of Dudley, Bartlett, Centre, Roxbury and Highland Streets. 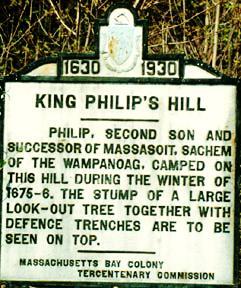 In 1675, Massasoit's son was known as chief or "King" Philip. He was upset over settlers' livestock grazing on wild Indian crops and the increased encroachment on Indian lands. The new Plymouth Colony Governor, Josiah Winslow, did nothing to appease the concerns of chief "King" Phillip. 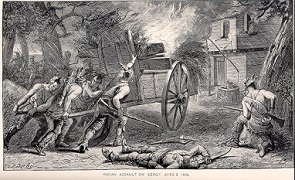 As a result, Indian warriors attacked more than half of New England's 90 towns. 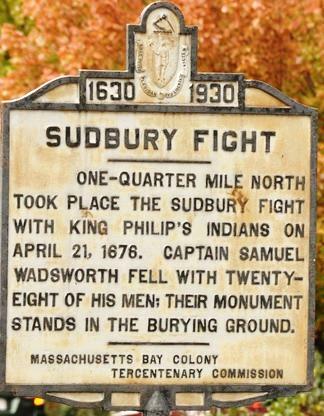 "Sudbury Fight, one-quarter mile north took place the Sudbury Fight with King Philip's Indians on April 21, 1676. 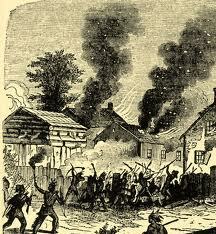 Captain Samuel Wadsworth fell with twenty-eight of his men. Their monument stands in the burying ground." "Mendon's First Meeting House, built 1658, destroyed by King Philip's warriors at the burning of the town 1676. Rev. Joseph Emerson - its only minister, ancestor of Ralph Waldo Emerson." 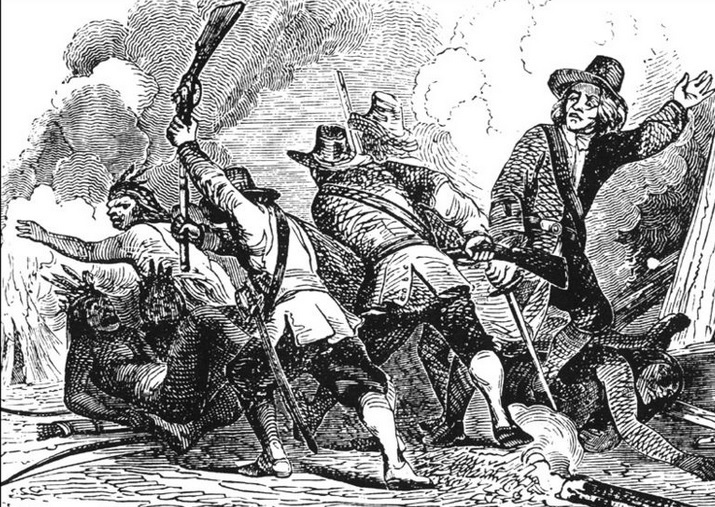 During King Philip's War from 1675 to 1678, over 800 settlers died, 1,200 homes burned, 8,000 cattle lost, and the entire English population of 52,000 in Massachusetts and Rhode Island was threatened to be driven back to the coast. 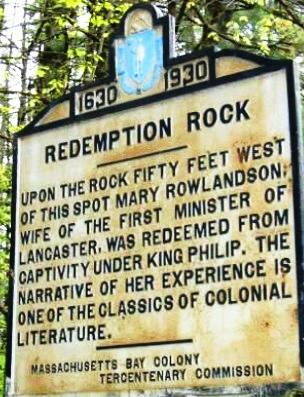 "Redemption Rock, Upon the rock fifty feet west of this spot Mary Rowlandson, wife of the first minister of Lancaster, was redeemed from captivity under King Philip. The narrative of her experience is one of the classics of colonial literature." 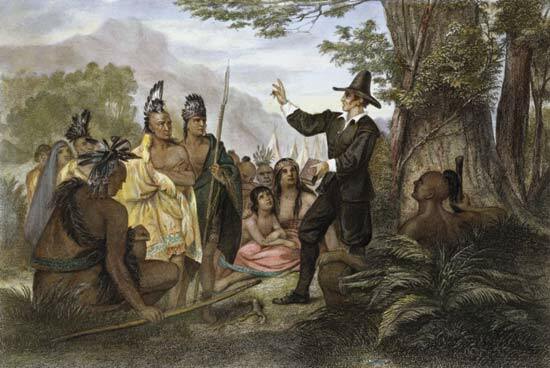 Unfortunately, John Eliot's Christian "Praying Indians" were caught in the middle, not being trusted by King Philip's warriors nor by panicking colonists. As a results, many tragically died. "Praying Indians Lived Here ... John Eliot converted Indians, including Tahattawan, to Christianity. 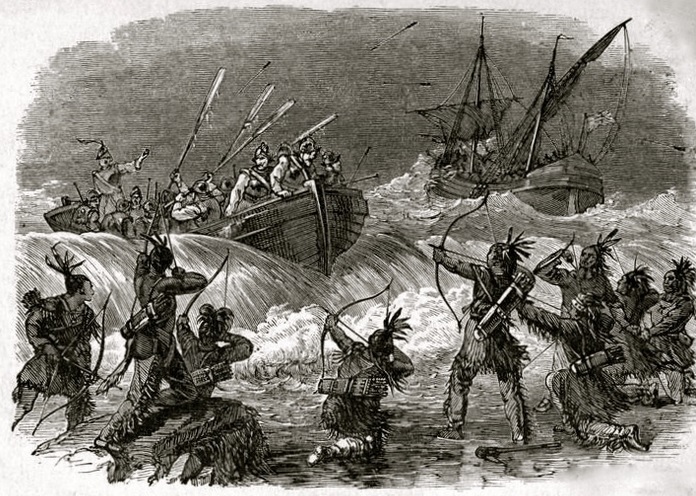 In 1654, during King Philip's War, Praying Indians were accused of mischief, rounded up and marched to Deer Island in Boston Harbor where many died. Survivors were released in 1677, but only a few returned, including Sarah Doublet. They were given 500 acres called New Town.Sarah Doublet died in 1730, the last Praying Indian. 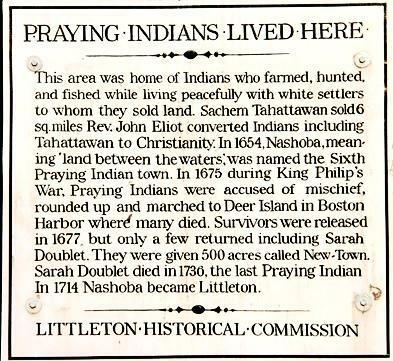 In 1714, Nashoba became Littleton." 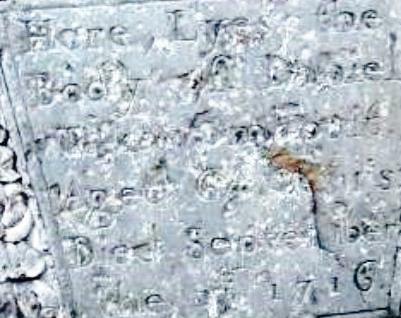 A small remnant of the Christian Wampanoag continued, with "Blind" Joe Amos bringing the Baptist faith to the Mashpee Wampanoag tribe in the 1830's. 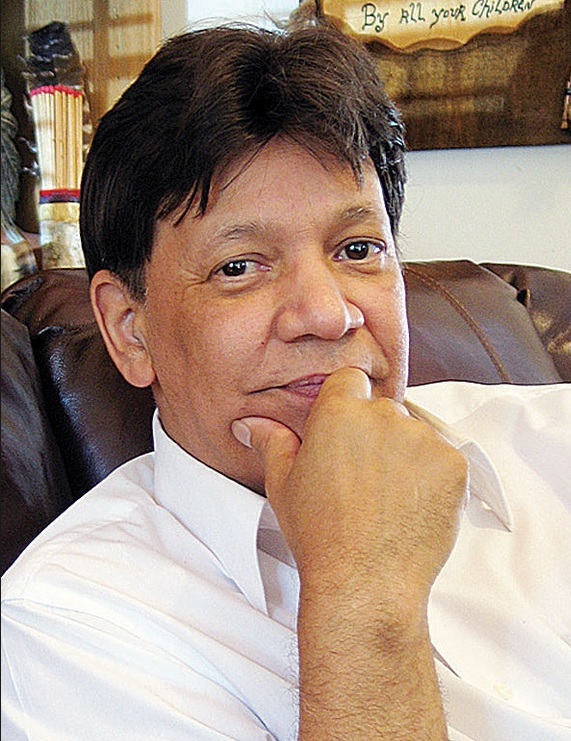 Mwalim Peters, a researcher of Mashpee Wampanoag history, stated that Rev. 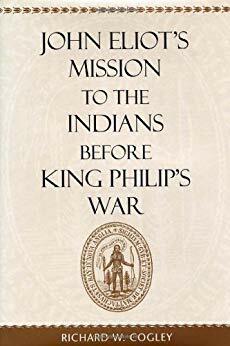 Amos "knew the entire King James Bible by heart and could recite it in both English and Wampanoag." "... preached under the shade of a large oak tree every Sunday throughout the seasons." He was joined by Rev. 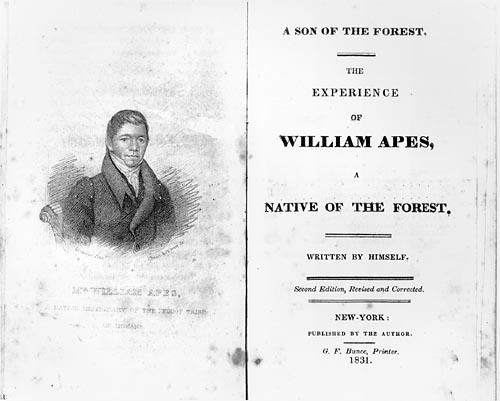 William Apes, an itinerant Pequot minister adopted by the Mashpee Wampanoag tribe. "Blind Joe was one of the preachers who brought the gospel to the Wampanoag people ... We are still here and we are still doing what Blind Joe did, and that's preach the word of God." 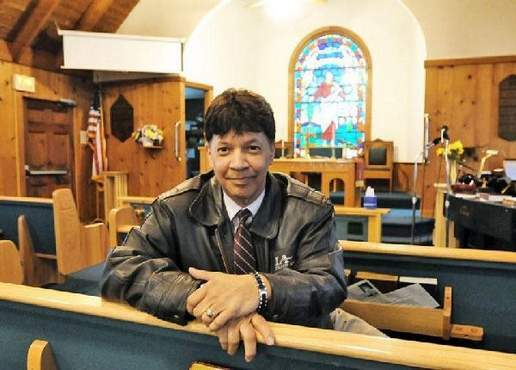 The pastor of Mashpee Baptist Church from 2007 till his death in 2014 was Rev. 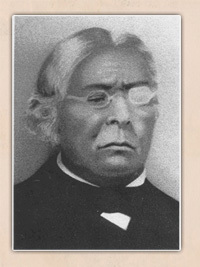 Curtis W. Frye, Jr., a great-great-great-grandson of Rev. Blind Joe Amos. It is so original, so close to the way it was back when they were preaching ... It is a very special atmosphere inside that building."